"My heart felt condolences to the Montante/Wood family. 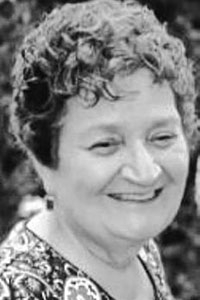 ..."
"Dear Montante family: I am truly sorry for your loss of..."
SCARBOROUGH - Ellen Frances Montante, 74, died on Sunday, Feb. 10, 2019, at South Portland Nursing Home. Ellen was born on March 16, 1944, in Rochester, N.Y., the daughter of the late Joseph and Palma (Madaffri) Grayson. She attended local schools and graduated from Nazareth Academy High School in N.Y. Following graduation, Ellen worked as a billing clerk in the medical field. On Feb. 23, 1963, she married Anthony Joseph Montante in Rochester, N.Y.
She was predeceased by her parents; and her husband, Anthony Montante; two sisters, Virginia Falletta and Mary Chiariello. She is survived by her daughter, Maria Wood of Scarborough, two sons, Anthony Montante of Scarborough, Thomas Montante of N.Y.; stepmother, Vivian Grayson; a brother, James Graziano of California; five grandchildren; and two great-grandchildren.